I’m a big believer in accessories. This wasn’t always the case. When I was young, I’d wear a single pair of sneakers with every outfit I owned. I had one bag. I rarely changed jewelry. But since my own style has become more simple and streamlined, I’ve found that accessories really bring an otherwise plain outfit to life. And it doesn’t take a great quantity, either. I find that a few things that are really beautiful, personal, or attention getting can do the trick just fine. I’ve also found that there seem to be two types of accessories I have to address. The first is functional accessories, things that really need to work with my life and circumstances in order to be well-loved. The second category is purely decorative accessories. This may include jewelry, decorative scarves, or anything else I wear purely to adorn myself. Functional accessories can be decorative too of course, but there is some element of usefulness to them. They might include shoes, bags, hats, belts, warm scarves, gloves, sunglasses, and legwear. These are all things you need to work for you in one way or another. You might not need all of these things, depending on your climate, and some might become purely decorative for you. Shoes: Comfortable, able to withstand some mud and dampness. Includes both comfortable heels and flats. Bags: One purse with long shoulder strap and plenty of pockets, and one larger tote type bag for work, to carry my laptop, lunch, etc. Belts: Very simple, thin, leather. Some for wearing with pants, some for wearing at the natural waist with dresses. Gloves: For Winter, they should preferably be knit (merino or cashmere) and be long enough to cover my wrists. Sunglasses: Dark and classic, black or tortoise frames. Legwear: Warm fleece-lined tights in Fall/Winter. Decorative accessories, like jewelry or pretty scarves, don’t really need to have all of these functional requirements. You can also include some things from the functional list that you wear purely for the sake of style. For example, if you don’t really need to wear a hat in the summer but like the way hats look on you, you can add them to this list. Scarves: Silk scarves in pretty colors for tying up my hair in the summer or wearing around my neck in the Fall/Winter. With these lists in mind, let’s turn back to our Spring wardrobes. The first question to ask yourself is how many of each item to include. This really depends on your own preferences, lifestyle, and also on how much you already own or want to buy/make. I’d already added a few pairs of shoes to my wardrobe for Spring. Now I’ve also added three bags (purse, work tote, plus a canvas tote for the market), hats, belts, spring scarves, and jewelry. Most of this I already own, so it’s easy. I now have pretty much everything I need to create a huge variety of outfits. All that’s left is the sewing! Make a list of requirements for your accessories. List what you consider to be functional accessories and decorative accessories, and what your requirements are for each. Decide how many of each to include for the coming season. 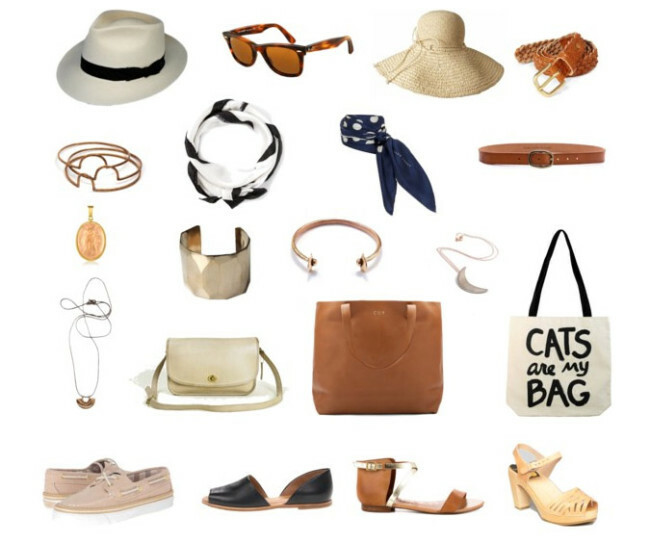 How many of each do you need for your current capsule wardrobe? 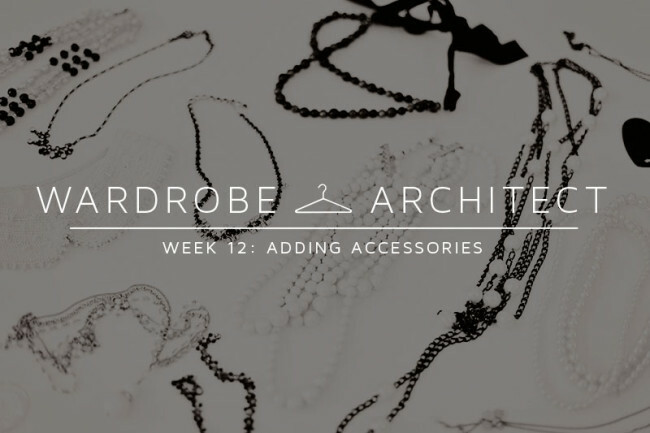 Add accessories to your capsule wardrobe. Be sure to look towards what you already own before window shopping! Are you an accessories lover like me? And what kinds of accessories are you most drawn to? For me, shoes are my biggest weakness. The posts in this series have all been so thoughtful and smart. Thank you! Great summary. I find since sewing my own garments I take a lot more care choosing accessories especially belts and shoes. Can’t get enough shoes though. Why doesn’t the husband understand? I think the French are right about investing in quality accessories; it can make or break your look. I have Hermes scarves from eBay that I’ve worn for 15 years, and they still make a statement. Good-quality vintage jewelry, such as 40s Mexican Silver or 50s Rebajes copper, can be affordable but still makes a splash. The vintage Yves St Laurent clutch I found on Etsy is my constant companion on a night out. It’s worth throwing a little money at something you can enjoy for years, particularly if its stellar vintage. Accessorize? I need some help here. I’m really going to work on this now that my closet in cleared, needed projects/clothing patterns/fabrics are coming into focus. Thank you. so much trouble finding shoes that i can walk in but don’t look orthopedic or athletic… especially in the summer…. Shoes. I am hobbled with a mental need to have shoes that coordinate with what I’m wearing if I ‘dress up’. This really does put quite the buzzkill on dressing up for me. I need the shoes that fit the lady with a hip replacement. I’d like them to ‘go with’ what I’m wearing. I guess that really lovely dress fabric will have to go. Damn. Why can’t technology make me a pair of shoes I can autocorrect the color on? Accessories are so fun to play with. For me, leg wear is something that can be either accessory or clothing, depending on the item. Some days, I will wear tights, basic black that go with everything; other days, I prefer crazy and colourful leggings (Black Milk is amazing) as my statement piece, with a more sedate dress. As for shoes… there are many mornings where my clothing is chosen based on the shoes I want to wear that day, and I have sewn several garments with the goal of highlighting favorite pairs. Accessorizing (decoratively) and shoe-buying is something I’ve been finally learning to do in the past couple years. I’ve figured out that there are two keys to it: (1) You have to LOVE your accessories. If you don’t love them, you won’t wear them, and they won’t look good on you anyway even if you make yourself wear them. This might mean it takes a long time to find the necklace or hat or bag or belt you truly love, but that’s OK — you’ll look great in it when you do find it, and won’t waste money on second-best things in the meantime. It’s also OK if there’s a whole category of things you don’t love — scarves are lovely on other people, but I feel silly and fussy in them, so I don’t wear them. (2) It’s OK to spend money on well-made accessories as long as you’re OK taking care of them. Well-made jewelry just needs an occasional cleaning and is functionally immortal. Well-made leather goods can last years with good care. Etc. I have a fashion deficient mother. I grew up where she didn’t use accessories so to this day, I really feel ignorant recognizing what accessories work with what I’m wearing, or don’t. I can say yes, that looks good when I see it on someone else, but to me, I think I look freaky. Therefore, I’m really quite subdued. Once my babies got big enough to not rip my earrings out, I put in a pair of continuous white gold hoops and have worn them constantly. Other materials often spur an allergic reaction so I am leery of switching them out. I don’t wear necklaces often because my curly hair tangles in chains and pulls. If I do, it’s a plain silver ankh my aunt gave me after a trip to Egypt. I’ve had and worn this necklace since I was 10. My standard accessories: Sunglasses and a scarf. Beyond that I’m lost. I don’t know what works. I have a mother who never wore jewelry or cared about fashion, too! And I totally have the same problem with jewelry — I have some beautiful pieces, but whenever I wear them it feels totally unnatural, like I’m playing dress-up. It looks so great on other people, but it never feels right on me. I read an interview with Michelle Williams a while ago where she talked about feeling like she looked dumb in jewelry (or maybe it was just earrings or necklaces in particular), so she rarely wore it and that became part of her style. I like to think that the absence of something that makes me self-conscious could be just as powerful as a fancy statement necklace. So pretty much all of my accessories are functional: scarves for warmth, comfortable-yet-stylish shoes, purses for lugging things around, and the only jewelry I wear regularly is a watch. My mom wasn’t much one for jewelry when I was a child (she started wearing jewelry after I was in college), but my paternal grandmother liked Statement Pieces. I have fond memories of looking through her jewelry drawer, for hours, with her as a child. Now, I have a hard time with dainty jewelry – either I go without or I wear big, interesting pieces (it helps that I’m 6 ft tall, as was my grandmother). Steelheart is right, though – I do think you have to love the accessory if you want to wear it. I love handbags and shoes, too. I have an amazing collection of vintage handbags, but I use them much less now that I’m a mommy with little ones (I need to have two hands free for crossing the street!) And shoes – except for special events – need to be pretty but walkable. Yup yup yup. My mom rarely wore jewelry, and it confuses me to this day. And I always feel uncomfortable in necklaces. They never seem to be the right weight or style or length and I can’t figure out how people do it! Mom and I did play around with earrings, though, and I have very fond memories of buying findings at the craft store and making them together! So I was like eight and walking around with earrings made out of Barbie spatulas. I have to admit that I’m not much of a shoe girl. My feet are extra-wide and on the larger side, and it’s really hard to find cute shoes in that size, and very rarely under $75 a pop. So I try to buy good quality shoes in neutral colors that will last a long time–basically, I have brown and black of each type of shoe I regularly wear, plus one pair of grey boots, some silver flat gladiator sandals, and the shoes I wore for my wedding. Jewelry is probably my main accessory of choice, and especially I love the funky, chunky beaded stuff! I got into making a lot of my own jewelry when I was a teenager, and have a ton of beads still– I haven’t made any in awhile, but I’ve been getting the itch to do so again! I’ve also been playing around more with belts and scarves, especially in colder weather for the latter, and am trying to figure out how I can incorporate those knitted scarf/shawl things into my everyday wardrobe, because there are some really cute shawl patterns out there! This is only tangentially related, but my biggest wardrobe challenge is layering. I live in San Francisco where you can be walking down the street warm with bare arms, then turn a corner into a shady wind tunnel and feel like you’ve changed seasons. I always have a knit cowl and a light merino cardigan in my bag, but it’s a challenge to plan an outfit that looks good when you’re putting on and peeling off 4 or 5 different layers all day! It’s not unusual to see someone in a sundress and a light parka. Anyway, two accessories I always carry are sunglasses and a scarf or cowl, no matter what the weather is like when I start out in the morning. Long necklaces and big earrings, which I’m usually smart enough to wear separately. And lots and lots of bags. If you can put something in it and carry it around, I want it. A few weeks ago I bought three in one day. Second-hand, but STILL … it’s not healthy. I used to buy cheap but fun shoes all the time, but then I was diagnosed with hypermobility and very flat feet, so I have to have shoes that will take my biomechanical orthotics, which are rigid. So no more heels, and preferably there needs to be a deep heel counter and insoles that lift out. No ballet flats, because they don’t stay on. The best are laceups or at least a broad strap. To begin with I found this really limiting – hiking trainers every day? – but there are a number of other options that still work; some Doc Martens styles do (even the more feminine ones) and Converse trainers. I have blue sequinned Converses that seem to lift any outfit! One thing that’s tricky is sandals, but I can wear Birkenstocks for a day and my feet don’t collapse. I have stopped worrying about whether my shoes look dainty, and just embraced chunkiness as a style statement.